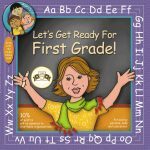 Home / Cedar Valley Publishing / Let’s Get Ready for Kindergarten! The Let’s Get Ready series from Cedar Valley Publishing has sold over 175,000 copies helping schools, teachers, parents and kids all prepare for Kindergarten! Teachers at home and in schools love it! It’s not a storybook or a workbook; it’s a book that covers the curriculum: the alphabet and numbers in and out of sequence, left and right, shapes, colors, high frequency words, positional words, opposites, rhyming, let’s read a story and so much more. Many schools purchase in bulk to use in testing Kindergarten readiness. It’s all in one engaging book illustrated with Mrs. Good, the teacher and six adorable Cedar Valley Kids that you simply read to children to learn. For ages 2-7.